AMERICAN BEAUTY-THIS IS THE1ST EDITION180 Gram Limited Edition AUDIOPHILE analogPRESSING WITHhigh-definition Virgin Vinyl pressing for superior fidelity.THIS TITLEIS THE COLLECTORS1ST EDITION RHINO AUDIOPHILEOUT OF PRINT 2003 RELEASE NOT 2011 RE-ISSUE180 GRAM LIMITED EDITIONANDIS TREMENDOUSLY RARE AUDIOPHILE LIMITED EDTIONS PRESSING THAT COULD BE THE ONE OF THELAST FACTORY SEALED COPIES LEFT IN THE WORLD OF THESE 1ST EDITIONS. COLLECTORS ARE ALWAYS LOOKING FOR AUDIOPHILE 180 GRAM EDITIONS IN THEIR 1ST EDITIONS. THESE RHINO PRESSINGS ARE THE ONLY WAY YOU CAN VERIFY THAT YOU HAVE THE 180 GRAM 1ST EDITIONS AND ARE NOW SELLING WELL OVER $150 IF YOU CAN FIND ONE STILL SEALED. LASTLY -The Grateful Dead Birth Of The Dead: Volume Two (The Live Sides) 180 GRAM LIMITED EDITION 2 LP SET AND THIS PRESSING IS FOR COLLECTORS THE 1ST TIME EVER ON VINYL. Collectors Alert: Many of these Vinyl Titles will never be available again.This means that this specific title is now out of print forever and there are very few remaining is sealed condition. This title is going to skyrocket in value & priceover the next few months. So Don't Miss Out on being one of the last people to own this outstanding pressing. This is onethe last pressing you will ever see at this price. Don't Miss Out. 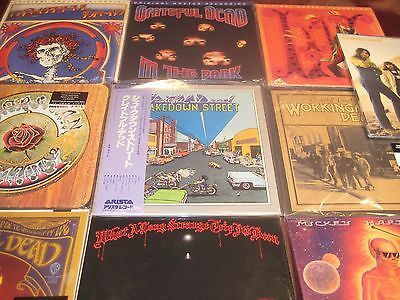 Please also visit mymusicfix e-baystores site for individualTitles, RareVinyl Records or24k Gold CD's at http://stores.ebay.com/MymusicfixCheck out my other items! The nicest thing you can do for your stylus and your ears. The ultimate record -- the way music was meant to be heard and of superior quality for any Audiophile. You should never pass up the opportunity to upgrade your collection. They're each very limited in their pressings and disappear with extraordinary quickness from the vinyl market. This causes prices to skyrocket because once they are gone, they are gone forever! Don't second-guess yourself with this chance to upgrade your collection because before you know it, the opportunity will have passed forever. Shakedown Street is a fascinating listen - classic sounds from a classic band. Even the jacket artwork is classic. The Grateful Dead led by Jerry Garcia were one of the cornerstones of '60s counterculture - the band had lots of members from diverse musical backgrounds, each lending a different facet to the band's sound and approach to music. 1978's Shakedown Street is their tenth studio album and is definitive Dead - essential to any serious rock collection, a fusion of rock, funk, blues, reggae, country and improvisational jam. Produced by Lowell George of Little Feat - the union between George and the Grateful Dead was certainly intriguing. The album features Garcia and Bog Weir on vocals and guitars, Phil Lesh on bass and vocals, Keith Godchaux on vocals and keyboards, Donna Jean Godchaux on vocals and Bill Kreutzmann and Mickey Hart on percussion. AMERICANBEAUTY - This is a 1970 companion album to Workingman's Dead. It features the Dead's best-known songs like "Sugar Magnolia," "Friend Of The Devil," "Truckin'" and "Ripple." This is the album that would remain as the Dead's studio masterpiece. The Grateful Dead is the debut album of the Grateful Dead. It was recorded by Warner Bros. Records, and was released in March 1967. The Grateful Dead band was formed in 1965 and is known for its unique and eclectic style fusing elements of rock, folk, bluegrass, blues, reggae, and country. Between 1967 and 1970, the Grateful Dead recorded five studio albums for Warner Bros. Records that formed the psychedelic canon on which the band’s live legend was built. Those albums were pressed on premium 180g vinyl at RTI and packaged as a Deluxe 5LP Box Set. This 180g LP is the same as the pressing that was included in that set. To ensure the highest degree of quality, this album was pressed on 180-gram vinyl at RTI using lacquers cut from the original analog masters by Chris Bellman at Bernie Grundman Mastering. The album features detailed replica of the original album packaging. Originally released in June of 1970, Workingman's Dead was the fourth studio album recorded by the Grateful Dead. In 2003, the album was ranked number 262 on Rolling Stone magazine's list of the 500 greatest albums of all time. The title of the album comes from a comment from Jerry Garcia to lyricist Robert Hunter about how "this album was turning into the Workingman's Dead version of the band." The sound of this album was influenced by Garcia's pairing with songwriter Hunter as well as the group's friendship with Crosby, Stills and Nash. The sound that C, S & N created made the Dead strive for a better, more harmonious sound themselves. Between 1967 and 1970, the Grateful Dead recorded five studio albums for Warner Bros. Those records formed the psychedelic canon on which the band’s live legend was built. The five albums were pressed on premium 180g vinyl at RTI and packaged as a Deluxe 5LP Box Set. This 180g LP is the same as the pressing that was included in that set. The Grateful Dead Birth Of The Dead: Volume Two (The Live Sides) 180 GRAM LIMITED EDITION 2 LP SET -180g Audiophile Vinyl Mastered by Friday Music's Joe Reagoso! Features Photos By Herb Greene Exclusive To This LP! The legendary Bay area rock superstars the Grateful Dead scored for over four decades a plethora of wonderful recordings throughout their incredible career. Spearheaded originally by the late great Jerry Garcia, Bob Weir, Phil Lesh, Bill Kruetzmann and the late Ron "Pigpen" McKernan, these five gentlement set the world on fire with their magnificent artistry and musicianship unparalleled to this day. Dead fan favorite Viola Lee Blues kicks off the rare collection, and then the fireworks light up as future Grateful Dead classics like Don't Ease Me In and the stellar Jimmy Reed classic Big Boss Man truly become a very important and interesting listen to any fan of the Dead or classic rock in general. Known for their jams in concert, you will get to hear stellar takes on rare blues tracks like One Kind Favor, Next Time You See Me and of course their super rare Bob Dylan interpretation of It's All Over Now Baby Blue, which would be an interesting choice not knowing there would be future collaborations with Dylan in both of their important later careers. Even superlative covers of Otis Redding's Pain In My Heart and the Slim Harpo blues champion I'm A King Bee are included in this amazingly important and historic rock release from this much loved band. Friday Music is very pleased to announce for the very first time on 180 Gram Audiophile Vinyl - The Grateful Dead's Birth Of The Dead Volume Two - The Live Sides. This deluxe 2 LP set not only has the original 14 live performances unearthed by the Dead themselves, but it also includes for the very first time anywhere several unearthed photos from the lens of the legendary Herb Greene. These first time issued photos show the very first sittings of the Grateful Dead and will make your listening hours that much more enjoyable as you stare at the brilliant pictures of your favorite rockers in this very special era. As a further installment in the exclusive and authorized Grateful Dead Friday Music 180 Gram Audiophile Vinyl Series, this fine album is part of a historical two part audiophile vinyl series along with the Birth Of The Dead Volume One - The Studio Sessions which was released in late 2013. Mastered impeccably for vinyl by Joe Reagoso (Grateful Dead) at Friday Music Studios and at Capitol Records, Hollywood, CA, this limited edition audiophile version of Birth Of The Dead Volume Two - The Live Sides will truly be a welcome addition to your Dead collection. Numbered, Limited Edition! Half-Speed Mastered from the Original Tapes: Ultra-Quiet Pressing Features Spacious, Transparent, Illuminating, and Organic Sound! Includes Many Longtime Staples of the Band’s Live Repertoire: “Playing in the Band,” “The Other One,” “Me and My Uncle,” “Bertha,” “Wharf Rat,” and More! TheGrateful Deadtook to the start of the 1970s as a different albeit equally thrilling and eminently broader-reaching band than the ensemble that revolutionized psychedelia in the late 1960s. Made evident in the back-to-back studio releasesWorkingman’s DeadandAmerican Beauty, the group increased its mastery of harmony-driven roots songs distinguished by catchy signatures, more concise arrangements, and impossibly organic textures.Captured live in spring 1971 and featuring not a single repeated song from Live/Dead, the expressive performances on Skull & Roses document this stylistic expansion in unsurpassed fashion. The double-LP constitutes the no-limits sound of an iconic band coming in to its own. Half-speed mastered from the original master tapeswith the utmost care, and part of the label’s unprecedented Grateful Dead reissue series,Mobile Fidelity’s numbered limited edition 180g 2LP version of Skull and Roses presents the downsized Dead lineup’s most memorable songs in previously unimaginable fidelity.From the momentJerry Garcia’sguitar pick touches a string at the outset of the scampering “Bertha,” the improvements are palpable: Life-size images, airy vocals, subterranean bass lines, incredibly spacious separation, tube-amp warmth, faithful tones, and balanced dynamicslead a crystal clear path to the music and the Dead’s extraordinary collective spark. Originally captured on a 16-track recorder, the songs brim with rarified levels of you-are-there realism and reach-out-and-touch immediacy.Notorious for its exacting sound demands, theDeadachieves the kind of instrumental and frequency-range transparency that many dedicated audiophiles spend their entire lives dreaming about.Skull and Rosesis a kernel of sonic truth.Such is the pressing’s degree of detail and insight that listeners will be able to debate what gauge guitar strings the members are using as they savor every last breath, riff, and snare hit. Thankfully, the band’s perfectionist attitude toward sound doesn’t literally transfer over to its music approach. Loose, lively, playful yet earthy, focused, and committed, theDeadcrackles with boogie-based moxie, greasy soulfulness, and swaggering bravado, each note seemingly exploding like tiny pieces of magic that hover in the air and cast hypnotic spells. The group’s embrace of leaner, tighter, more melodically incisive songs and the swaying rhythms that accompany the approach directly relate to two key lineup changes: the temporary departure of drummerMickey Hartand permanent leave of keyboardistTom Constanten. As a result, theDeadtoured as a quintet, withBill Kreutzmannthe sole percussionist andGarcia, bassist Phil Lesh, guitarist/singer Bob Weir, and keyboardist/vocalist Ron “Pigpen” McKernanrounding out the barer-bone cast. Not only doGarcia, Lesh, and Weirshow tremendous growth as singers, theDeadas a whole further invest in folk, country, R&B, rock, and blues traditions—viaGarcia’ssweeter tones and Bakersfield picking,Weir’scowboy twang and increasingly confident counterpoints,Kreutzmann’shang-fire beats and scurrying grooves,Lesh’sweighty sway,McKernan’sforeshadowing spiritual timbres. Inspired covers of tunes byMerle Haggard(a frisky and defiant “Mama Tried”),Willie Dixon(the comfortably rumbling, boozy honky tonk “Big Boss Man”),Kris Kristofferson(the dusty, peaceable tale “Me and Bobby McGee”),Chuck Berry(a supercharged romping “Johnny B. Goode”), andBuddy Holly(“Not Fade Away,” segued into “Goin’ Down the Road Feeling Bad”) announce theDead’s intent to make practically every style of contemporary American music their own, and in the process — to paraphrase the greatBill Graham— be the only ones that did what they did. A similar attitude informed the record’s genesis. The group originally lobbied to call the albumSkullfuckbefore the record label, at an allegedly chaotic meeting at the infamous Hyatt Hotel, dissuaded the humorous ploy. While technically named Grateful Dead, the album is commonly known asSkull and Rosesdue toAlton Kelly and Stanley Mouse’s now-iconic cover art. Trivia buffs might know the latter is based on an illustration for an antique edition of theRubaiyat of Omar Khayyam. The 1971 effort also has another huge claim to fame: It included the message “DEAD FREAKS UNITE. Who are you? Where are you? How are you?” Those simple lines, and the invitation to respond, created of theDeadheadsubculture and biggest fan list in history, utterly pioneering the industry overnight. Get it all—the dazzling graphics, dizzying performances, deft sonics—by ordering your prized collectable edition ofSkull and Rosestoday! In the Darkwill forever be known as the Grateful Dead record that propelled the iconic band into the mainstream conscious more than two decades after its career began. Thanks to undeniable hooks, sing-a-long refrains, and shrug-it-off sentiments on the survivalist anthem "Touch of Grey," the Dead was exposed to new generations of listeners and, in the process, became celebrity figures that packed football stadiums with fans. But In the Dark remains significant for many other, more important reasons-Jerry Garcia's stunning recovery from a coma, Garcia and Bob Weir's compelling dynamic, and an impeccable batch of tunes. It also stands bar-none as the sextet's finest output since 1975. Half-speed mastered from the original master tapes and part of the label's unprecedented Grateful Dead reissue series, Mobile Fidelity's numbered limited edition 180g LP of In the Dark presents the Dead's long-overdue breakthrough in attention-grabbing fidelity. Even in an era in which the most revered artists succumbed to the day's prevailing sound (namely, slick textures and artificial keyboard-heavy production that evoked the feel of Saran-Wrap) the band remained obstinate in its allegiance to revealing fidelity. As it happened, the Dead recorded most of the record live onstage at Marin Civic Auditorium using the then-newly introduced Dolby SR-a technology that permitted astounding instrumental separation, even when playing live. The group's inimitable blend now sounds better, more immediate, and natural than ever. Everything including the clip-clop of cowbells, Mickey Hart and Billy Kreutzmann's rhythm-devil grooves, Phil Lesh's supple bass lines, Garcia's sweetened timbre, and Brent Mydland's pastel-shaded keyboard melodies converges into a delightfully balanced, animate entity. The music possesses tube-like warmth and glow, and the band's renewed vigor and, particularly, Garcia's mellifluous guitar tones and rippling passages, come across with irresistible immediacy, heft, and vitality.